Before KCLU signed on air, radio audiences in the Ventura/Santa Barbara areas had limited choices for local and national broadcast news, and virtually no in-depth radio coverage of important community issues. However, on October 20, 1994, that all changed. As a result of the foresight and vision of California Lutheran University’s Board of Regents and the support of its faculty and administration, KCLU was born and was quickly embraced by the community. 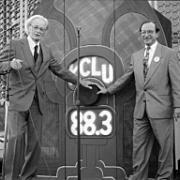 Former Californian Lutheran University President Luther Luedtke (R) and the "poet laureate of radio," Norman Corwin, at KCLU's sign on in October 20, 1994. In 22 years, the station has grown dramatically from a few thousand listeners per week to almost 130,000 weekly listeners. From signing off at midnight in the early years, to broadcasting 24 hours a day from Westlake to San Luis Obispo (and worldwide at KCLU.org), the station is on the move. KCLU listeners have made this dynamic growth possible with their dedicated listening and active financial support. Committed to providing the tri-counties with in-depth reporting, the station has developed a stellar reputation among listeners for local news and public affairs programming. In addition, KCLU has repeatedly been recognized for its excellent news coverage by professional organizations including The Associated Press Television Radio Association, The Los Angeles Press Club, the Radio Television News Directors Association of Northern California and the Radio and Television News Directors Association of Southern California. KCLU has received over 300 major journalism awards.